Posted on June 7, 2018 by kodi.berry@noaa.gov. This summer the KPHI TV crew is joined by Caroline Kolakoski and Jordan Overton! Caroline is a senior at the University of South Alabama studying operational meteorology while also talking classes in broadcast meteorology. She is currently conducting research on correlating atmospheric instability parameters with sea breeze-driven convection. Caroline is part of the Hollings class of 2017 and excited to be a part of the KPHI TV team. Jordan is a senior at the University of Oklahoma studying meteorology with minors in both mathematics and broadcast meteorology. 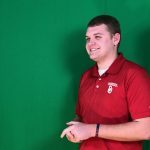 Jordan is the President of OU Student Chapter of the AMS/NWA, the Senior Weather Producer for OU Nightly, OU’s Student run TV Broadcast, and also serves as a student media assistant for the School of Meteorology at OU. He hopes to pursue a career in TV Broadcasting when he graduates. KPHI TV Funded for 2019 and 2020!